Nik Wallenda has become the first man to walk across the Grand Canyon on a tightrope – without a safety harness or net. The daredevil was greeted with cheers as he crossed the high wire 457 metres above the Little Colorado River Gorge. It was 22 minutes and 54 seconds of pure terror, with the event broadcast live around the world. After he completed the walk, the “King of the High Wire, got on his knees and blew a kiss. “I did it,” he said, wiping his eyes and hugging his wife and children. “It was way more windy and the movement of the cable and the side walls as I was walking were getting in the way and confusing,” he said afterwards. It had taken “every bit of me to stay focused that entire time. My arms are aching like you wouldn’t believe”. The stunt comes a year after Wallenda traversed Niagara Falls earning a seventh Guinness world record. He used the same five-centimetre-thick cable he used to cross the falls. Before stepping out onto the wire he said a prayer. He told reporters before he did the stunt that he would “give my wife and kids a hug and a kiss and tell them I’ll see them in a bit”. When he stepped onto the high wire, he realised his shoes had dust on them, making them slippery. He repeated “Thank you Jesus” and “Praise you Jesus” during the walk and at one point asked God to help “calm the cable down”. Wallenda is a seventh-generation high-wire artist and is part of the famous “Flying Wallendas” circus family – a clan that is no stranger to death-defying feats and great tragedy. Nik Wallenda, who was born a year after his great-grandfather died, began wire walking at the age of 2, on a 60cm high stretched rope. He grew up performing with his family and has dreamed of crossing the Grand Canyon since he was a teenager. French high-wire walker Philippe Petit had that same desire and set up a cable above the Little Colorado River, but Navajo officials said he never went through with the stunt and left his equipment there only to be taken down recently by Wallenda’s crew. 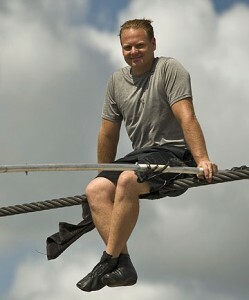 In New Zealand, Wallenda’s walk was screened with a 10-second delay on the Discovery Channel. Wallenda was wearing two cameras, one looking down the mostly dry Little Colorado River bed and one facing straight ahead. His leather shoes with an elk-skin sole helped him keep a grip on the steel cable as he moved across.